Combine flour, sugar, lemon zest and egg yolks in a large bowl. To obtain well shaped cookies make small balls of dough (1/2 inch of diameter) and spread them down with your hands to obtain cookies about 1/3 inch thick. Lay the cookies on a baking sheet. Bake in the oven at 320 F for about 20 minutes or until slightly brown. Let chill for a while. 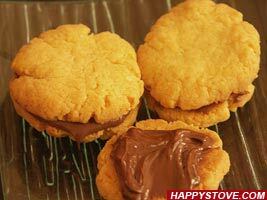 Spread some Nutella on one side of a shortbread cookie and cover with a second cookie to make your sweet sandwich. You can use the chocolate spread of your choice instead of Nutella. As an original variation, you can add some grated coconut to the Nutella. To increase the hazelnut flavor of the cookies, try to partially substitute the all-purpose flour with hazelnut flour. If you have a cookie cutter, roll out the dough using a rolling pin, to obtain a layer 1/3 inch thick. Cut the cookies with the shape of your choice using a cookie cutter.